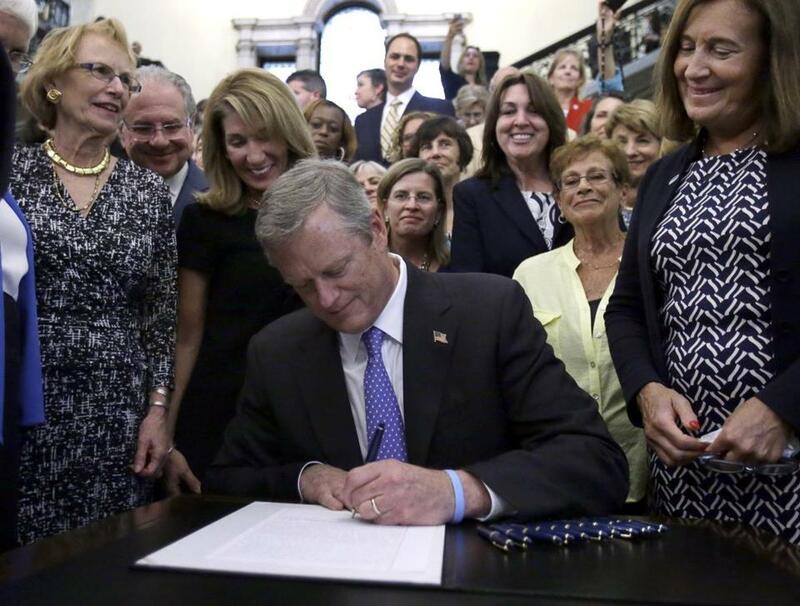 Supporters watched as Massachusetts Governor Charlie Baker signed an equal pay bill into law Monday. With Massachusetts passing the strongest equal pay law in the country, this means I can finally find out what Globe columnist Dan Shaughnessy makes and demand I be paid the same. The law, which Governor Charlie Baker signed on Monday after unanimous support from the Legislature, will help narrow the gender wage gap, but it’s more complicated than mandating a woman with the same job title collect the identical paycheck as the guy next to her. Our pay equity law is distinctive for three reasons: It promotes salary transparency, restricts employers from asking candidates about salary history, and gives legal incentives to companies that conduct salary reviews. Does the new era of transparency mean I can ask my colleagues what they make? Under the new law, companies cannot ban employees from openly discussing salaries with each other. But that doesn’t mean your co-workers have to tell you. So Dan, there’s no reason to avoid me in the hall. Similarly, I can go to HR and ask what Shaughnessy makes and not get glared at. But chances are I won’t be told because the law also preserves the ability of employers to protect confidential information of employees. So how does this help anyone? Ultimately, the new law aims to create a workplace environment in which employees can talk about wage gaps and compel employers to monitor and fix them. Think about what’s happening in the tech industry after pressure from shareholder activists led by Natasha Lamb of Arjuna Capital . The Boston-area executive has successfully pushed companies — from Apple to Microsoft — to publicly report gender pay inequities, which means there can be accountability. Transparency can help women — and men — determine whether they are fairly paid. Women in Massachusetts make on average 82 cents for every dollar a man earns; black women fare worse, at 61 cents, and Latinas are at 50 cents. The thinking is that awareness is half the battle. State Treasurer Deb Goldberg has even set up a website, equalpayma.com, to help women understand how underpaid they might be. Does this mean people with the same job title must make the same amount of money? Federal and state laws have been on the books for decades to prohibit gender-based wage discrimination. The laws have allowed for differences in pay based on experience. For example, Shaughnessy and I have the same title, and if there is a difference in pay, it might be because he has more than two decades of seniority on me. What’s new is that the state now provides better ways to compare the work of two employees in the same or similar jobs. The new law provides standards based on skill, responsibility, and effort, provided the jobs are performed under similar working conditions. The legislation rose out of a lawsuit that a group of female cafeteria workers in Everett lost. They alleged they did comparable work as the school’s male custodians, but the women were paid about half as much. The court ruled that the state law did not set a standard for comparable work so that’s what lawmakers fixed. What’s the big deal about salary history? Women traditionally earn less than men and asking female candidates about wage history could lock them into lower salaries. Under the new law, employers during the interview process cannot ask candidates what they make in their current position. Associated Industries of Massachusetts, a business group that first opposed then supported the pay equity legislation, is advising members to update job applications and not include a salary requirement. If a prospective employee volunteers that information, it is OK for the employer to discuss and confirm. It is also OK after an employer makes a job offer with a salary figure to talk about wage history. I can’t help myself here, but let me offer a tip to any job candidate — male or female. If a prospective employer asks for a salary in an interview, don’t give out a specific number. Let the company make the first offer and negotiate from there. If pressed, offer a range of compensation. That’s the best advice I got from a salary negotiation workshop sponsored by the city of Boston. How can salary reviews make a difference? The new law encourages companies to evaluate salaries in order to detect disparities among employees. If firms do so, they will get added legal protection if a worker sues for gender-based wage discrimination. For example, if a company discovers pay inequities during its review and then is sued for discrimination, it has a three-year window to demonstrate it has taken steps to eliminate the gap. Compensation disparities often aren’t intentional, but unconscious bias and salary history can keep wages lower for women. As the bill was being crafted, lawmakers heard stories from companies — including those run by female CEOs — that when firms looked they found unequal pay between male and female employees that could not be explained. That’s why the city of Boston has launched an ambitious project to collect wage data from dozens of businesses to analyze gender disparities. The process itself forces companies to take a closer look at why some women are paid less than male counterparts. How will we know if the new law is a success? That’s easy. It’s working if Shaughnessy starts wondering if he makes as much money as me.